[toc]Artery disease refers to those vascular ailments where the vital function of arteries of supplying nutrients, oxygen and blood to the body gets affected by either through some damage or disease. There are two major forms of artery disease – coronary artery disease and peripheral artery disease. 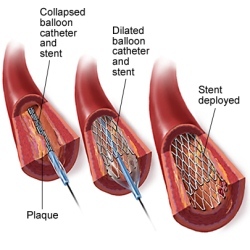 In coronary artery disease, the plaque accumulation occurs that narrow downs the coronary arteries, delivering less amount of blood to heart. These plaques are usually formed from cholesterol deposition within the arteries and can eventually lead to complete blockage casing heart attack. Peripheral artery disease is a circulatory problem where peripheral arteries supplying blood to limbs get narrowed and is a sign of widespread fatty deposits accumulation in arteries (atherosclerosis). Blood flow to brain, heart as well as legs get reduced remarkably. Coronary artery disease gets developed over decades of accumulation of plague within the coronary arteries and usually remains unnoticed, till one undergoes a heart attack. But, but by knowing certain signs and symptoms of these disease, one can take measure to prevent as well as treat the coronary artery disease, saving one from a heart attack. The decreased floe of blood results in breathlessness, chest pain and eventually a heart attack. One may experience a chest tightness or extreme pressure as if somebody is standing over the chest and this chest pain (angina) is normally triggered by emotional or physical stress. It may go away after a few minutes of stopping the strenuous activity. In women, this angina pain may appear as sharp or fleeting pain that is felt in back, abdomen or arm. When plague build up continues within the coronary arteries, it results in complete blockage of the blood flow leading to a heart attack. The classical signs of heart attack will be a crushing pressure over the chest, extreme pain within the arm or shoulder and profuse sweating at times. Women may also experience atypical signs of pain in jaw or back and nausea. But, at certain times, heart attack may occur without showing any such symptoms or signs. Due to lack of adequate blood supply by the heart to various parts of the body, one may undergo extreme fatigue or shortness of breath under extreme exertion. The heart is having it hard to manage the demands of the body, resulting in lack of oxygen to lungs. Under peripheral artery disease (PAD), the extremities mainly legs do not receive adequate blood to fulfill the required needs of the limbs resulting in certain specific symptoms. Peripheral artery disease can be easily treated by exercising, following healthy diet and quitting tobacco eating. While many cases may not show any symptoms or only mild signs of the disease, but in other instances, there could be a distinct leg pain while walking referred as intermittent claudication. The symptoms include leg cramping, muscle pain of legs or arms on triggered by some activity that usually fades away on resting. The location of muscle pain is dependent on the position of clogged artery with calf region as the most common location of the pain. The severity of this intermittent claudication varies from being mild to debilitating pain. Under severe intermittent claudication, it becomes extremely hard to walk or perform physical activities. Progression of peripheral artery disease may result in pain even while lying down or resting state, referred as ischemic rest pain. It can be severe enough to disrupt the sleep. Hanging down legs over the bedside or walking for a while within the room cam relive the pain temporarily. There can appear numbness or weakness of legs, soreness of feet, toes or legs that does not appear to heal. There could be hair loss or slower growth of hair on legs and feet, weak pulse in feet or legs, or even erectile dysfunction in men.